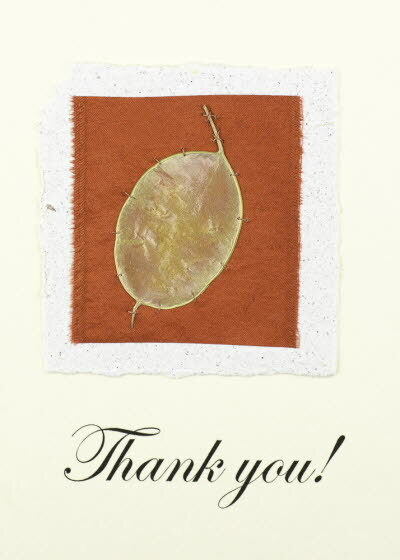 This Thank you card design features a pearlescent seed pod of the honesty plant sewn onto red madder-dyed habotai or dupion silk. The white paper is made from shredded computer printout. Each 6" by 4" card has an honesty pod hand sewn on silk or handmade paper and a Thank You greeting printed on the cover. The inside of the card is left blank for your own message. Scroll down the page for more handmade Honesty thank you cards.